The Honda CR80R is a motorcycle produced by Honda from 1980 to 2002.
came in just the one color: Tahitian Red. The engine color was red. The fuel tank stripe was white. The seat was black with a white "80R" logo. The box-section swingarm was silver. The fuel tank was steel. It also had twin rear shocks. The engine was an 80cc 2-stroke reed valve, air-cooled single cylinder with a 6-speed transmission. The serial number began JH2HE0201BK100009. 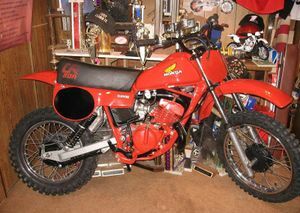 The CR80R'82 was no longer called Elsinore but it was still available in Tahitian Red. The engine color was black. The number plate panels were black. The fuel tank was plastic, not steel. The seat was black with a white "80R" logo. The rear suspension was Pro-link. The wheel rims were aluminum alloy. 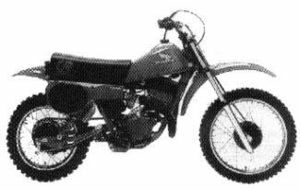 The engine was an 80cc 2-stroke reed valve, air-cooled single cylinder with a 6-speed transmission. The serial number began JH2HE0201CK200015. 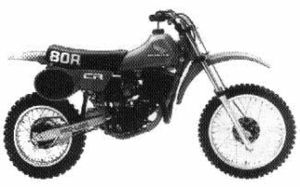 The CR80R'83 was available in Flash Red. The engine color was black. The number plate panels were black. The fuel tank was plastic, not steel. The seat was blue with a white "CR" logo. The swingarm decal was black. The wheel rims were aluminum alloy. 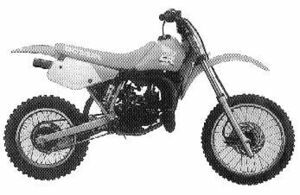 The engine was an 79cc 2-stroke reed valve, liquid-cooled single cylinder with a 6-speed transmission. The serial number began JH2HE0400DK000001. 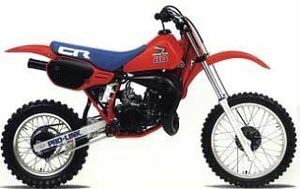 The CR80R'84 was available in Flash Red. The engine color was black. The number plate panels were black and shaped a little differently. The fuel tank was plastic. The seat (now thinner) was blue with a white "CR" logo. The swingarm decal "80R" was red and white. The wheel rims were aluminum alloy. 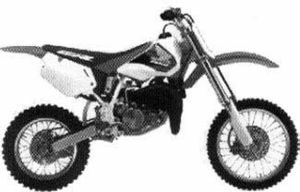 The engine was an 80cc 2-stroke reed valve, liquid-cooled single cylinder with a 6-speed transmission. An ATAC™ exhaust valve was added.. The serial number began JH2HE040XEK100009. 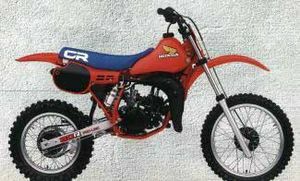 The CR80R'85 was available in Flash Red. The fuel tank wing decal was red, white, and blue. The fuel tank decal "80" was red and blue. The engine color was black. The number plate panels were black. The seat was blue with a white "CR" logo. The "PRO-Link" swingarm decal was solid blue. The wheel rims were aluminum alloy. 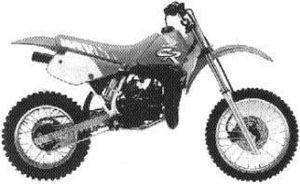 The engine was an 83cc 2-stroke reed valve, liquid-cooled single cylinder with a 6-speed transmission. An ATAC™ exhaust valve was added. The serial number began JH2HE040XFK200001. The CR80R'86 was available in Flash Red. The bike had a front disc brake. The "80" fuel tank decal was red, outlined in white. The engine color was black. The number plate panels were black. The seat was blue with a white outline "CR" logo. The "PRO-Link" swingarm decal was blue. The wheel rims were aluminum alloy. 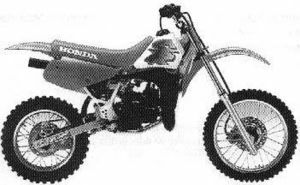 The engine was an 83cc 2-stroke reed valve, liquid-cooled single cylinder. The cylinder was Nikasil® with a 6-speed transmission. The ATAC™ exhaust valve was deleted. The serial number began JH2HE0404GK300001. The CR80R'87 was available in Flash Red. The bike had a front disc brake. The "80" fuel tank decal was white. The engine color was black. The number plate panels were black. The seat was blue with a solid white "CR" logo. The "PRO-Link" swingarm decal was blue. The wheel rims were aluminum alloy. 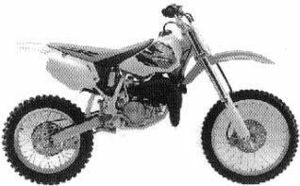 The engine was an 83cc 2-stroke reed valve, liquid-cooled single cylinder. The cylinder was Nikasil® with a 6-speed transmission. The ATAC™ exhaust valve was deleted. The serial number began JH2HE0409HK400001. 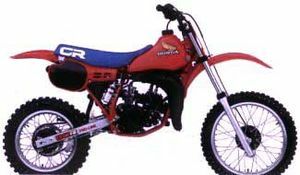 The CR80R'88 was available in Fighting Red. The bike had a front disc brake. The "CR 80" fuel tank decal was white. The engine color was black. The number plate panels were white. The seat was red with a white "HONDA" logo. The "PRO-Link" swingarm decal was blue. The wheel rims were aluminum alloy. The engine was an 83cc 2-stroke reed valve, liquid-cooled single cylinder. The cylinder was Nikasil® with a 6-speed transmission. The serial number began JH2HE0408JK500001. 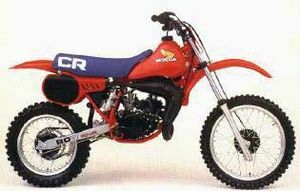 The CR80R'89 was available in Fighting Red. The bike had a front disc brake. 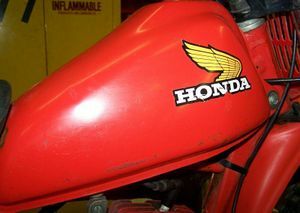 The "HONDA 80R" and new style wing decal was white. The engine color was black. The number plate panels were white. The seat was red with a white "CR" logo. The "PRO-Link" swingarm decal was blue. The wheel rims were aluminum alloy. The engine was an 83cc 2-stroke reed valve, liquid-cooled single cylinder. The cylinder was Nikasil® with a 6-speed transmission. The serial number began JH2HE0408JK500001. 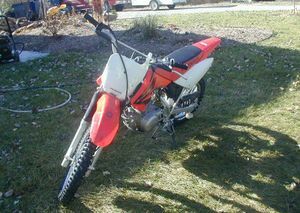 The CR80R'90 was available in Flash Red with Shasta White. The bike had a front disc brake. The "HONDA CR" wing decal was blue with a white outline. The frame was Shasta White. The engine color was black. The number plate panels were white. The seat was red with a white "CR" logo. The "PRO-Link" swingarm decal was blue outline. The wheel rims were aluminum alloy. 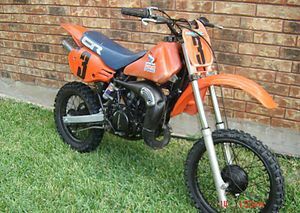 The engine was an 83cc 2-stroke reed valve, liquid-cooled single cylinder. The cylinder was Nikasil® with a 6-speed transmission. The serial number began JH2HE040*LK700001. The CR80R'91 was available in Flash Red with Ross White. The bike had a front disc brake. 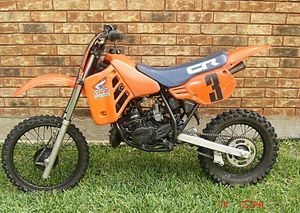 The "CR" tank logo was white, yellow, and orange. The frame was Ross White. The engine color was black. The number plate panels were white. The seat was red with a white graphic. 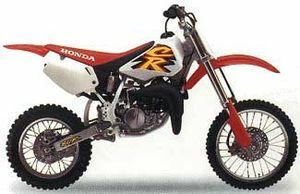 The "80R" swingarm graphic was red. The wheel rims were aluminum alloy. 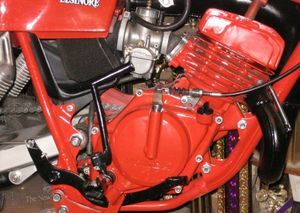 The engine was an 83cc 2-stroke reed valve, liquid-cooled single cylinder. The cylinder was Nikasil® with a 6-speed transmission. The serial number began JH2HE040*MK800001. 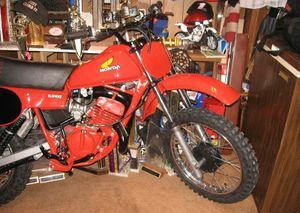 The CR80R'92 was available in Nuclear Red with Shasta White. The bike had a front disc brake. The fuel tank was white with a red "CR" logo with blue outline. The fuel tank wing logo was deleted. The rear wheel received a disc brake. The frame was Ross White. The engine color was black. The number plate panels were red. The seat was red with a white "HONDA" logo. The "80R" swingarm graphic was blue. The wheel rims were aluminum alloy. The engine was an 83cc 2-stroke reed valve, liquid-cooled single cylinder. The cylinder was Nikasil® with a 6-speed transmission. The serial number began JH2HE040*NK900001. 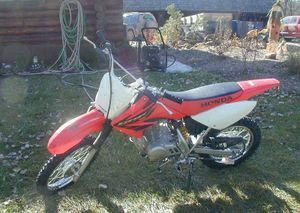 The CR80R'93 was available in Nuclear Red with Shasta White. The fuel tank was white with a blue "CR" logo with white outline. The red color is a deeper red. The frame was Ross White. The engine color was black. The number plate panels were red. The seat was red with a white "HONDA" logo. 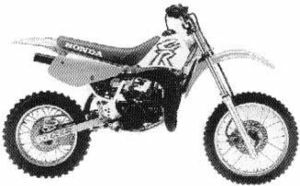 The "80R" swingarm graphic was blue. The wheel rims were aluminum alloy. Both wheels have disc brakes. The bike now came with a removable triangular side stand. The engine was an 83cc 2-stroke reed valve, liquid-cooled single cylinder. The cylinder was Nikasil® with a 6-speed transmission. The serial number began JH2HE040*PK000001. 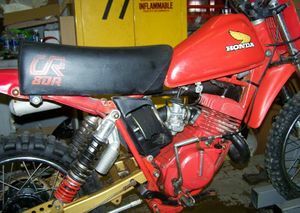 The CR80R'94 was available in Nuclear Red with Shasta White. The fuel tank was white with a fluorescent yellow "CR" logo with purple outline. The red color is a deeper red. The frame was Ross White. The engine color was black. The number plate panels were red. The seat was red with a white "HONDA" logo. 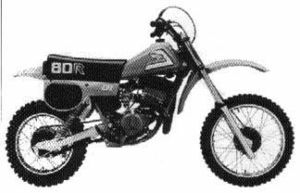 The "80R" swingarm graphic was a purple outline. The wheel rims were aluminum alloy. Both wheels have disc brakes. The rear tire is a Dunlop K695. The bike now came with a removable triangular side stand. 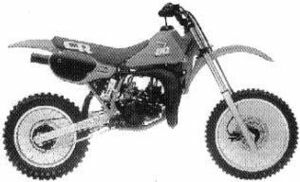 The engine was an 83cc 2-stroke reed valve, liquid-cooled single cylinder. The cylinder was Nikasil® with a 6-speed transmission. The serial number began JH2HE040*RK100001. The CR80R'95 was available in Nuclear Red with Shasta White. The fuel tank was white with a fluorescent yellow "CR" logo with purple outline. The engine color was black. The number plate panels were red. The seat was red with a white "HONDA" logo. The "80R" swingarm graphic was fluorescent. The wheel rims were aluminum alloy. Both wheels have disc brakes. The rear tire is a Dunlop K695. The bike now came with a removable triangular side stand. The engine was an 83cc 2-stroke reed valve, liquid-cooled single cylinder. The cylinder was Nikasil® with a 6-speed transmission. The serial number began JH2HE040*RK100001. 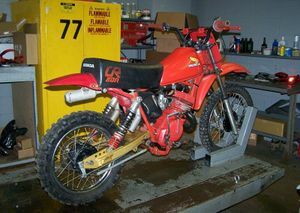 The CR80R'96 was sold in 1996 which came in one color: Nuclear Red with Ross White. It had the distinctive "Team Honda" Red, White, and Black colors. The "CR" logos were fluorescent yellow. The wheel rims were aluminum alloy. Both wheels have disc brakes. The rear tire is a Dunlop K695. The bike now came with a removable triangular side stand. The engine was an 83cc 2-stroke reed valve, liquid-cooled single cylinder. The cylinder was Nikasil® with a 6-speed transmission. The Serial number began JH2HE040*TK300001. 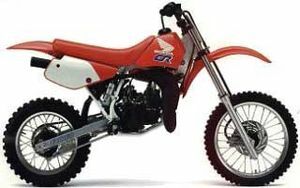 The CR80R'97 was sold in 1997 which came in one color: Nuclear Red. The fuel tank logo was redesigned to include a yellow "HONDA" wing logo. 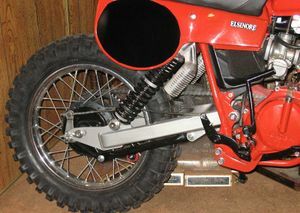 The front fork leg protectors were white. The "CR" logo on the seat was black. The front fender was red while the rear fender was white. The wheel rims were aluminum alloy. Both wheels have disc brakes. The rear tire is a Dunlop K695. The bike now came with a removable triangular side stand. The engine was an 83cc 2-stroke reed valve, liquid-cooled single cylinder. The cylinder was Nikasil® with a 6-speed transmission. The Serial number began JH2HE040*VK400001. The CR80RB'97, called the "Expert," was sold in 1997 and came in one color: Nuclear Red. The fuel tank logo was redesigned to include a yellow "HONDA" wing logo. The front fork leg protectors were white. The "CR" logo on the seat was black. The front fender was red while the rear fender was white. The wheel rims were aluminum alloy. Both wheels have disc brakes. The rear tire is a Dunlop K695. The bike now came with a removable triangular side stand. The engine was an 83cc 2-stroke reed valve, liquid-cooled single cylinder. The cylinder was Nikasil® with a 6-speed transmission. The Serial number began JH2HE043*VK100001. 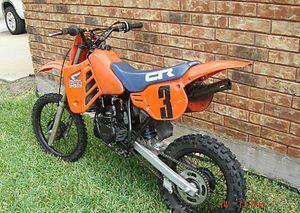 The CR80R'98 was sold in 1998 which came in one color: Nuclear Red with Ross White. The fuel tank logo was redesigned again. The front fork leg protectors were white. The "CR" logo on the seat was white. Both the front fender and rear were red. The front brake master cylinder and lever are the same as the 1998 CR125R and CR250R. The wheel rims were aluminum alloy. Both wheels have disc brakes. The rear tire is a Dunlop K695. The bike now came with a removable triangular side stand. The engine was an 83cc 2-stroke reed valve, liquid-cooled single cylinder. The cylinder was Nikasil® with a 6-speed transmission. The Serial number began JH2HE040*WK500001. The CR80RB'98, called the "Expert," was sold in 1998 and came in one color: Nuclear Red with Ross White. The fuel tank logo was redesigned again. The front fork leg protectors were white. The "CR" logo on the seat was white. Both the front fender and rear were red. The front brake master cylinder and lever are the same as the 1998 CR125R and CR250R. The wheel rims were aluminum alloy. Both wheels have disc brakes. The rear tire is a Dunlop K695. The bike now came with a removable triangular side stand. 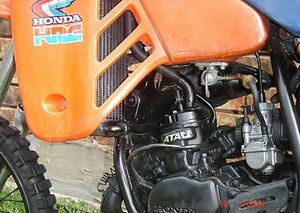 The engine was an 83cc 2-stroke reed valve, liquid-cooled single cylinder. The cylinder was Nikasil® with a 6-speed transmission. The Serial number began JH2HE043*WK200001.